WARNING!!!! Tire Pressure is Low! As my mouth uttered those words, the Holy Spirit reminded me of when Jesus asked Peter to come and walk on water with him. The scripture reads…. I thought to myself, what does my vehicles tire pressure and Peter have to do with anything? God always has a purpose, even in the mundane. This is what I believe the Holy Spirit showed me. I drove to work, came back home and all was fine with the world. As I reflected on this I thought, how many times in life situations do I take my eyes off of Jesus? The chaos going on around me distracts me and I begin to sink. All because I allowed the winds of life, the storm raging, the water splashing hard upon my face to distract my focus off of Jesus. If I can so boldly and with such assurance say about my trials/storms what I said about not looking at the tire pressure, I would live life with a lot more peace, yes even in the storm. It’s not that the low tire pressure warning wasn’t in my face all the way to work and all the way home, it was, beeping and flashing at me (just as the storm was in Peter’s face while he was walking on water out to Jesus). I just chose to ignore it until I could take care of it. Worrying, calling my husband (who was already at work), or getting angry and upset at myself for not remembering was not going to get that tire filled. But relying on God to be with me was the most important thing I did have. Okay, please don’t misinterpret me. I’m not saying to ignore your cars warnings. But what I am saying is this. When…. – things at work aren’t going well; don’t look at the tire pressure. – finances are tight and you don’t know if what you have will cover all the bills; don’t look at the tire pressure. – your ceiling is leaking due to a bad winter; don’t look at the tire pressure. – your children are making choices contrary to what you’ve taught them; don’t look at the tire pressure. – the house is a hot mess, laundry is piling up and kids aren’t helping; don’t look at the tire pressure. But check out what happened when I did utter that still small prayer. The bible says that Jesus INSTANTLY reached out and the storm ceased. You see, God showed up, watched over me, got me to work and home safe, and best of all, I didn’t look at the storm. My eyes stayed fixed on the one who could make the storm cease. I pray the Lord would help me to always respond in this way in all of my trials/storms. But even if I don’t and I lack faith; He will still save me and the storm will eventually cease. I Praise you for ME!!! One of my favorite things to do is admire God’s wonders. As I drive into work daily I quickly look to the heavens and stand in awe of God’s beauty. I love the way he commands the sun to rise every morning. The beauty of its rays penetrating through the clouds. The beautiful colors that are so vibrant that you can’t help but just stand amazed at how He puts it all together. In that awe I can’t help to praise him for his wonderful works and am reminded how he created it all. His creation never ceases to amaze me. As I think about His beauty God begins to speak to my heart, “Sharon there is one wonderful and beautiful creation you never acknowledge and give me praise for”. Oh man, I thought. LORD, but every morning I acknowledge you in the sun rising, in the sky as it wakes to praise you, in the birds singing as spring tries to creep in (But Mr. Winter won’t let him, Ha had to throw that in there), in the sun shining on even what I may think to be my worse day, even in the cloudiest and rainiest of days. LORD you are ALL GOD in it all! In HIS sweet and loving voice He says, “Sharon, you never acknowledge and praise me for creating YOU”. Sayyy whaaaaaaaaatttt!!!! I paused and really let this sink in. Is it true, could it be that I don’t praise HIM for me? Hesitant I ask the Holy Spirit to show me evidence of how do this. My desire is to bring Glory to God and in no way offend the works of His hands. If I go on I will fill this entire blog, but you get the gist of it. My stinkin thinkin’ is taking away from HIS Omnipotence, from HIS Greatness!!!! We can probably compare it to the way we feed our bodies junk. When we eat junk foods, don’t exercise and never fill our bodies with nutritional food, the effect is going to be weight gain, feeling sluggish and having no energy. Feeding our bodies with just junk is not taking care of God’s temple. Do you think we can say that this holds true to our thinking as well, to our thought patterns? Let’s just say for a moment that Stinkin Thinkin represents junk food. If the effects to feeding our bodies junk food is low energy and/or weight gain, then what can we say about our minds? Can we say the same? 6 For the mind set on the flesh is death, but the mind set on the Spirit is life and peace, 7 because the mind set on the flesh is hostile toward God; for it does not subject itself to the law of God, for it is not even able to do so . My mind set on, (how Joyce Meyer best demonstrates it in her Robot) “What about Me” or on thoughts that are not set on the Spirit, as this scripture describes, are thoughts that are hostile towards God. Ouuuuuchhhh! Your probably thinking (because I know I did) so, what are you saying, that I will never have a negative thought in my life? No, that is not what I’m saying at all, but I will give you a solution. I’ve learned and strongly believe that with everything God shows us about ourselves, he provides a solution because His desire is that we would be more like HIM. The apostle Paul said it best when he said…. When any stinkin thinkin’ tries to creep its way in my mind, my job is to take it captive to the obedience of Christ!! If I have the mind of Christ those examples that I provided are definitely not thoughts that GOD would put in my mind so they have no place in my mind! The solution….. The same way that we would take steps toward living a healthier life style by eating better and exercising, it is so with our minds. We take those negative thoughts captive and like Paul also said in Colossians 3:2, set your mind on things above. Let’s think about what we are thinking about!!!! As a young girl growing up, even as an adult, whenever anyone faced a difficult trial, almost always I heard someone tell another person, “You have to be strong”. I myself have done this. For example…. If someone passed away, I would hear someone tell a loved one, You have to be strong. If a friend betrayed you……You have to be strong. If a family member received a bad report from the doctor…..You have to be strong. If parents got divorced……You have to be strong. If you’ve lost it all had to live somewhere that was not home……You have to be strong. One of the biggest trials I’ve ever faced, other than infidelity, has been not living in our home for 2 ½ years. Though we are grateful for family taking us in, it was a trying time for our own family. We didn’t have our space, our things, our privacy. This brought a HUGE burden on our family. I remember crying out to God (knowing that it was our poor financial choices that got us there in the first place) and saying, “What DO YOU WANT with me, haven’t you broken me enough? Am I still not learning? Am I being proud? Are you trying to humble me because I have pride?” You name it I asked it (and when I say I cried out, it was more like yelling at GOD). Well guess what, he didn’t answer the way I wanted him to, but I will say this. As I sat in my car yelling at him, toward the end of my tantrum, I couldn’t help but feel this overwhelming peace. No, GOD didn’t speak audibly, no I didn’t turn on the radio to a song that spoke to my circumstance or turn on the television set to a preaching that spoke truth to my life. It was just God, me and MY WEAKNESS. During that trial God spoke this truth into my life. 8 Three different times I begged the Lord to take it away. 9 Each time he said, “My grace is all you need. My power works best in weakness.” So now I am glad to boast about my weaknesses, so that the power of Christ can work through me. 10 That’s why I take pleasure in my weaknesses and in the insults, hardships, persecutions, and troubles that I suffer for Christ. For when I am weak, then I am strong. You see like Paul I PLEADED/ BEGGED for God to take it all away. For him to just PLEASE help our family get home. But I remember when God gave me this verse I change the way I spoke to God. 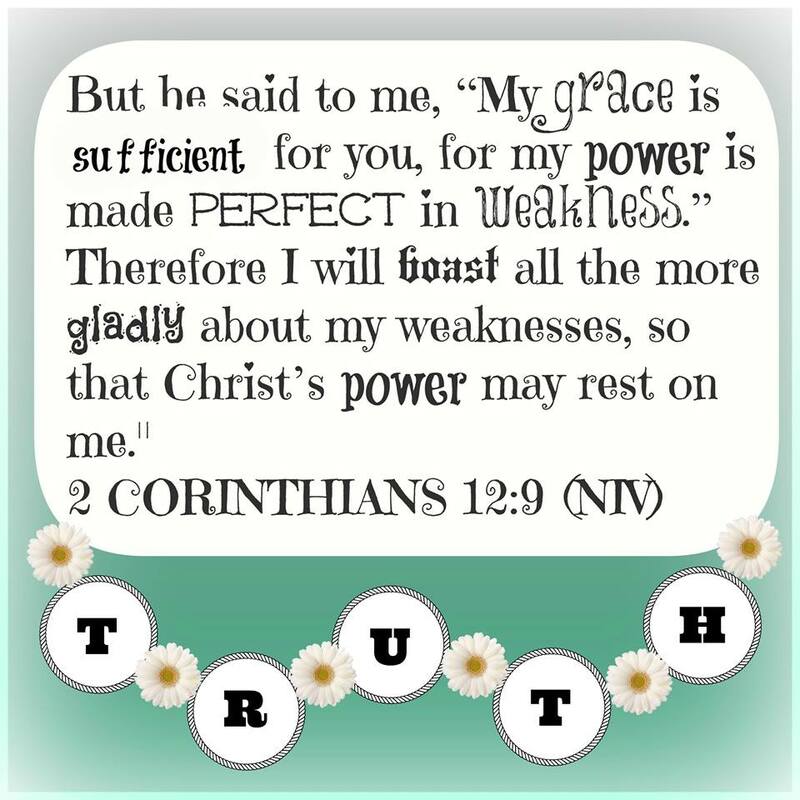 So instead of complaining I began to ask GOD, “Father what do you want me to learn in this trial?”; and this is what I learned about my weaknesses during that time…. I also learned t hat I can’t always change my circumstance, bad things will happen, and I DON’t want to depend on me to fix it. I don’t want to live life thinking that I have to be super strong. I want, I NEED to be weak, so that HIS Power would be PERFECT in MY Weakness. You mean I too have access to those Treasures? New King James Version (NKJV) 3 I will give you the treasures of darkness And hidden riches of secret places, That you may know that I, the Lord, Who call you by your name, Am the God of Israel. Has there been a time in your life when for many years God has shown you a scripture, be it in your alone time with Him, in a message on a Sunday morning or even through a word that was spoken over your life and you just know, that you know, that you know that it holds a secret just for you but you just don’t quite know what it is? Well this scripture has been that for me, until this week that is, during our OBS through Proverbs 31. I can’t say that weight has been a struggle for me. But I can say that I struggle with believing God. As I kept reading this scripture I began feeling that nudging feeling again of, there is a secret in this for you Sharon. Well silly owe me of course think to myself, …”okay Lord when you want to reveal things to me you will”. But the more I thought about it the more I felt there was a secret in it for me. It wasn’t until today that I began to try and break down the verse to see if I would discover what God was trying to tell me. So this is how I began…. Treasures of Darkness- Treasures that the enemy has kept from us, from our families..Treasures locked up that haven’t been see for years maybe. In this point in time it was the treasure that the Babylonians were withholding from the people of Israel…. “Oh yeah that’s awesome”, I thought!!! Hidden riches of Secret Places- Hidden riches that obtained in that secret place, riches for Just me!! !…Oh hmmm interesting!!! As I went on trying to dismantle this, God began speaking life through this verse and this is what He showed me. Sharon…. Jacob…It was in that dark moment when Jacob wrestled with God that he received his blessing, because he persevered and would not let go. Though he came out limping he received a new name, Israel which means, he who struggled with God. Moses….it was in the darkest moments of God’s people that Moses saw GOD in the secret place and received the ten commandments. Joshua…. it was in the darkest moment when Moses had died and Joshua was chosen to lead Israel into the promise land. He did it afraid, was led by God, chose to believed God and the walls of Jericho fell down. David….it was in the darkest moment when David (the anointed of God) sinned against God, repented and went on to be called a man after God’s own heart! JESUS….it was MY SON, in the darkest moment when he was nailed to that Cross, conquered Death and obtained VICTORY for you. Went to the pit of hell took back the treasures of darkness and gave you those hidden riches that the enemy for so long kept from you! WOW!!!! You see we too have access to those treasures of darkness, to those hidden riches! What allowed every one of these men to obtain it? They LET GOD LEAD them!!!! They went through great trials to obtain those treasures and when they felt unqualified or lacked strength, they went to the source, the one who CALLED them by name! That they, that you, that I would know that HE (GOD), the Lord, who calls you (insert your name here) by your name, IS the God of Israel. All for the Glory of HIS Name!! !